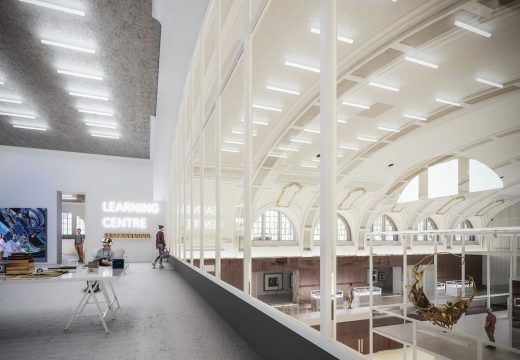 The category B-listed building will be transformed into a cultural facility with exhibition spaces, learning suite, café and retail space. 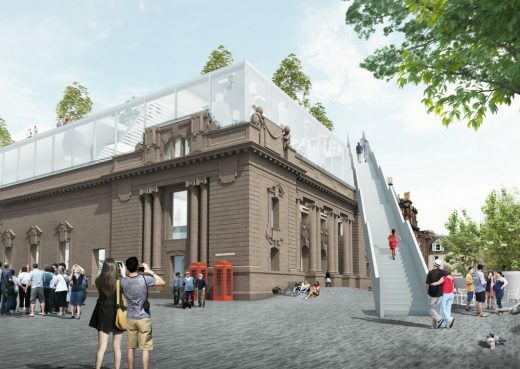 Mecanoo Architects from The Netherlands emerged as Perth & Kinross Council’s preferred partner to bring forward a transformation of the historic Perth City Hall following an international design competition after winning the most support during a public engagement exercise. Seeing off four other shortlisted teams Mecanoo will now be tasked with overhauling the current attraction and surrounding public realm to create a £20m museum. Detailed designs will now be drawn up ahead of an expected planning application next year, withy work commencing on-site sometime in 2019. The Mecanoo team includes BB Heritage Studio, Arup, Aecom, BDP, Cushman & Wakefield and GWP. 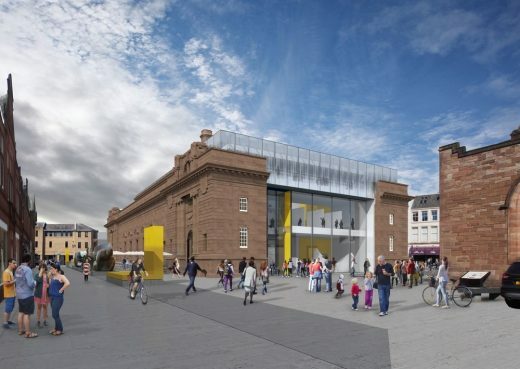 Perth & Kinross Council are exhibiting five shortlisted designs for the redevelopment of Perth City Hall, enabling the public to have their say on initial concept designs. The architects are bidding for the cultural attraction, which is set to become a centerpiece of the its 2021 UK City of Culture bid. When complete the revitalized hall will house interactive displays, learning facilities and a meeting space in the centre of town. Austin-Smith:Lord with MVRDV’s approach will see a dramatic staircase installed to allow those up for the climb to ascend all the way to a dramatic new rooftop garden from St John’s Square. Hoskins meanwhile propose to improve access with a new raised plinth with existing entrances opened up and circulation rationalized, culminating in a new temporary exhibition space in the roof. 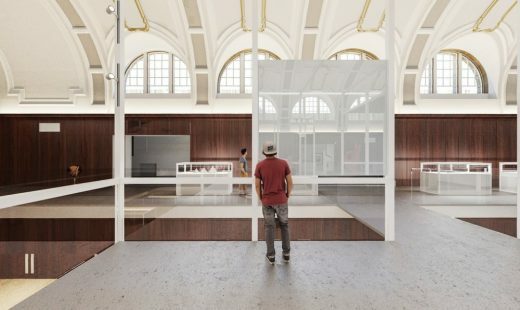 For their part LDN plan to install a series of exhibition plinths along the Hall’s south side, outlining the edge of a raised plinth reserved for cafes. A ‘21st century entrance’ will also be formed facing St John’s Kirk taking the form of a full-height glazed wall. Mecanoo have opted for a more understated approach with retention of the existing roofscape, although existing solid doors will be replaced with glazed alternatives. Last but not least Richard Murphy Architects aim to remove the central portion of the north elevation in its entirety, save for the cornice and parapet which will rest on a new steel beam, in order to insert a new glass wall. The ground floor would also be lowered to sit flush with surrounding streets. The five designs will be on display until 24 June at Perth Civic Hall from 10:00 until 19:00 on weekdays and 16:00 on weekends. Five of the biggest names in UK architecture are vying for the right to redesign Perth City Hall with the building’s re-opening scheduled for 2021, reports The Courier. A shortlist has been drawn-up of firms whose experience includes some of the most significant museum and theatre projects in recent history. They will now develop initial design concepts for the listed Edwardian building before revealing them to the public in June. The people of Perth will then have an opportunity to have their say on the firms’ visions before a final decision is taken by Perth and Kinross. It is anticipated that the winning architects will be confirmed by the end of the year with construction work then starting in 2019. 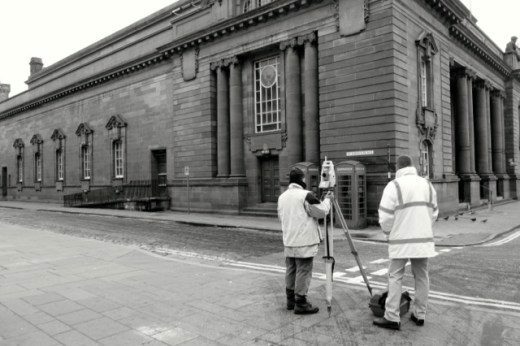 The building would then reopen in 2021 to coincide, the council hopes, with Perth being UK City of Culture bid. Perth and Kinross Council voted in June to bring the building back into public use with the vision of increasing the city’s capacity to display collections of national significance, house major touring exhibitions and feature national and oversees loans. 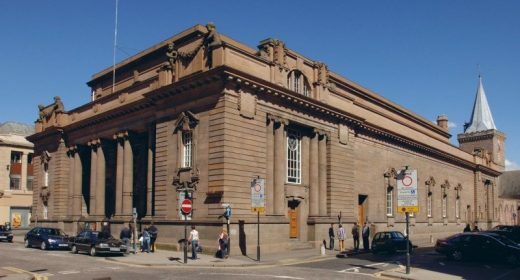 Together with a £10m investment to transform Perth Museum and Art Gallery, it is planned that the two venues will tell the story of how Scotland’s ancient roots were forged in Perth in the Kingdom of Alba and how modern Scots, including the painter John Duncan Fergusson, shaped the modern world. This project aims to renew and enhance the existing Edwardian Theatre in the centre of Perth and was won in competition in September 2008.